Today I am a guest designer at the Runway Inspired Challenge! I just fell in love with this outfit! 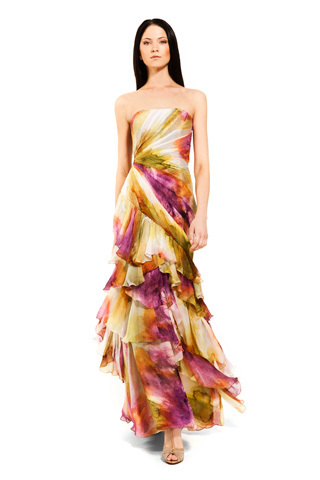 The colors, the flow of the fabric, it is just simply gorgeous! Right away I knew I wanted to recreate those colors just as they are on the fabric. To me it seemed like water colors splashed into each other. I was also inspired by the pleats on the bodice and how the fabric looks like satin, although the ruffles of the skirt looks like chiffon to me. I created the fan by cutting out two semicircles and using a protractor to measure and make the score lines. I then white embossed a branch and bird stamp from Stampin’Up!’s “Art of the orient” set, and used an aqua painter to apply some inks. Then I folded the fan along the score lines and cut out very thin strips of black card stock (using a paper trimmer) and attached them to the back of the fan along the folds. Finally I glued the end of the strips after I placed them on top of one another, just like in a real fan. I also made the tassel using black embroidery thread. And lastly, I cut the middle circle using a circle cutter, and punched out the two small circles, then adhered a piece of ivory satin fabric on the back. I just had to have some satin in the card! It actually looks a lot prettier in real life, which I couldn’t capture in the picture…however, you can still click on the picture and enlarge it to see the texture. 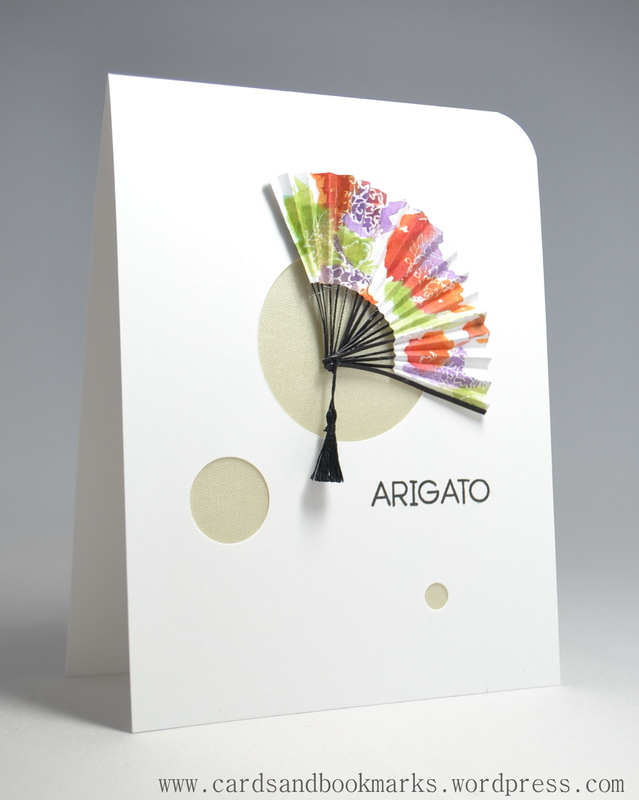 I am sure most of you know, but in case you don’t, “Arigato” is Japanese for Thank You. I though it was quite fitting with the fan. Please make sure to visit the Runway Inspired Challenge and check out what the design team has created. And if you are inspired, like I was, make a card and submit it for a chance to win a $15 gift card to Simon Says Stamp. So pretty, Tansim! I love that fan and those circles and all that white space! Just gorgeous! Just found your site from Laura’s. You work is beautiful! This card is a work of are. Wow this is simply stunning Tasnim…what an excellent idea and you have executed it so beautifully!! !fabulous card!! Congratulations on your guest designer spot, Tasnim! I love your card, wonderful inspiration! Oh my goodness…I can’t believe you made the fan by hand! It is absolute genius. And that tassel too! I’m soooo happy you are guesting with us this month Tasnim! Wow this is an awesome card…love your style. What an absolutely gorgeous project! 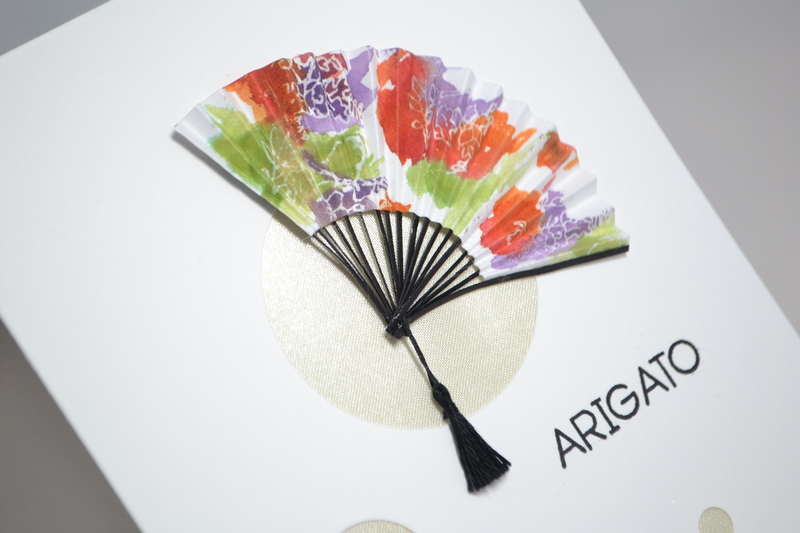 Beautiful card – love your fan! !